This dress is an exact replica of Miss Six’s version, but in a size 5. I’m going to let the pictures do the talking. 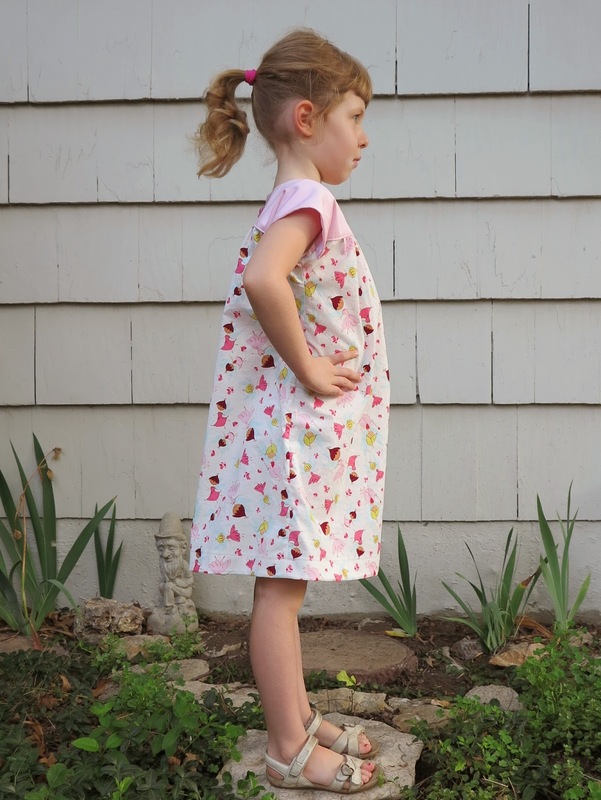 It is such a simple make, but so cute and comfortable and just perfect for preschool. The fabric is covered in lots of little pink fairies. It’s not my cup of tea, but I purchased it especially for this little middle peep. I must have chosen well. She is making a heart for me with her hands (upside down of course!). And that’s all there is to it. I guarantee you will be seeing more of these over the next few years. 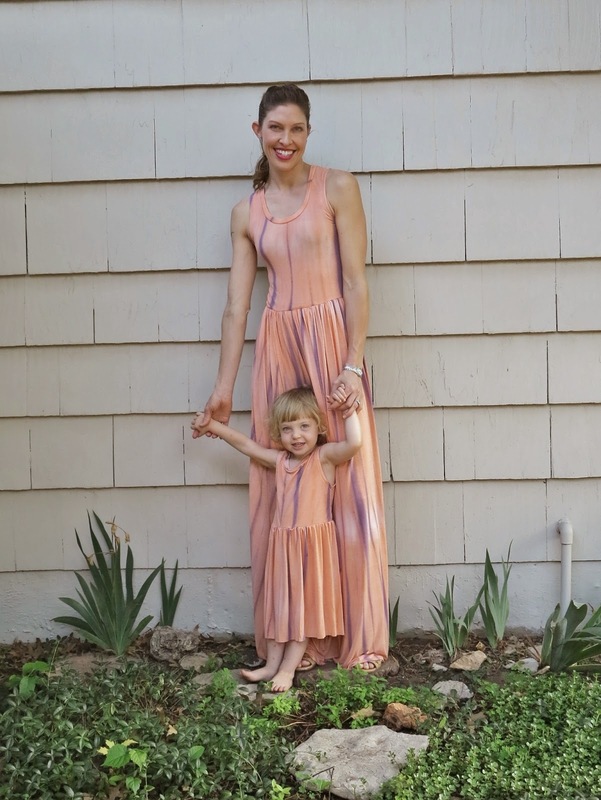 This entry was posted in cotton, dress, Hawthorne Threads, Ice cream dress, Oliver + S on August 25, 2014 by Debbie Iles. The pants in this ensemble are yet another crack at my TNT pants pattern, Vogue 8909. You’ve seen other versions before (here, here, and here). This time, I made them using silk jersey. They are so comfortable it’s criminal and I suspect they will be getting a lot more wear than simply with this dress. 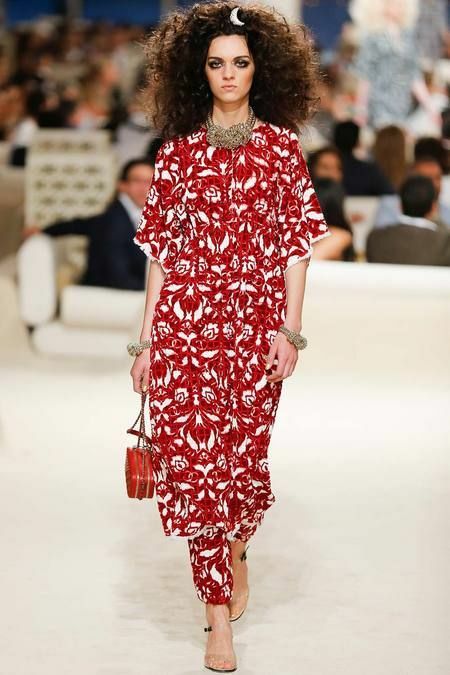 The rest of the dress was inspired by my current Chanel infatuation. 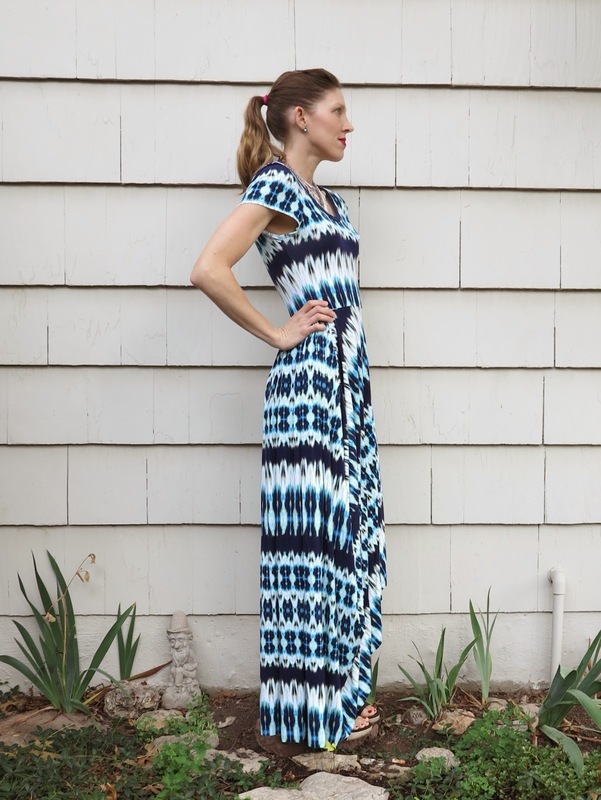 You’ve seen the Ikat jersey print before and I’m quite sure that you will be seeing it again. I still have a few kid size remnants left in my stash. The silk chiffon from Tessuti is gathered into a skirt that overlaps at the side to flare and swish as I walk. I’m not entirely sure how I feel about this outfit. It was actually my first attempt at a Chanel-inspired ensemble (my second attempt in Cracked Glass silk CDC was a winner!). The pants are definitely here to stay. But it’s quite possible that you will be seeing the dress come back as something entirely different down the track. 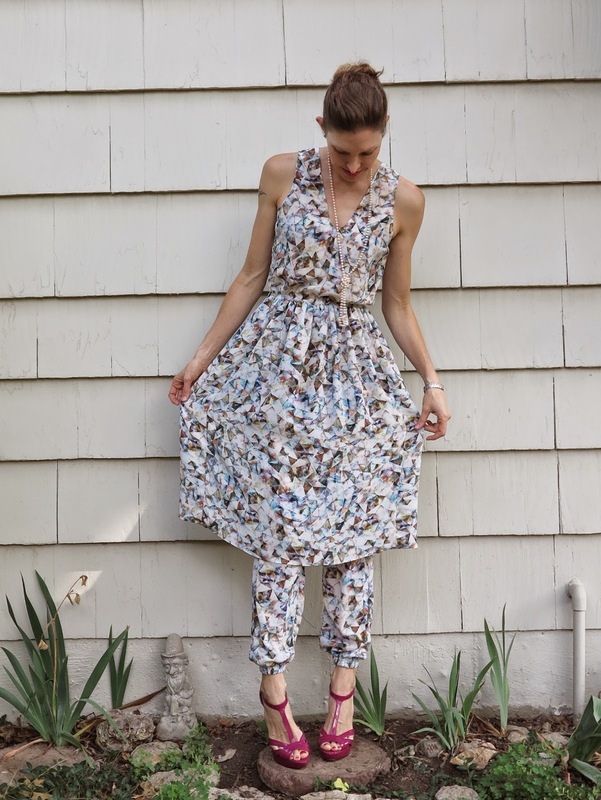 This entry was posted in dress, jersey, Mood, pants, self-drafted, Tessuti Fabrics, V8909 on August 21, 2014 by Debbie Iles. I rarely purchase quilting weight cottons, but this fabric just jumped into my shopping cart a few weeks ago. It’s from Hawthorne Threads and such a delightful little border print. 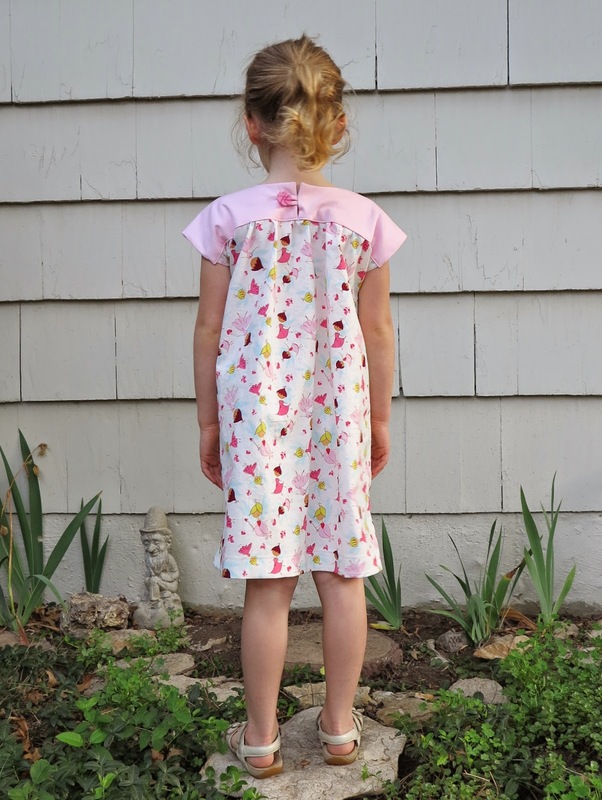 The dress is a modified version of the Oliver + S Ice Cream dress. I just skipped the dress panels and pockets so I could make use of the border print better. 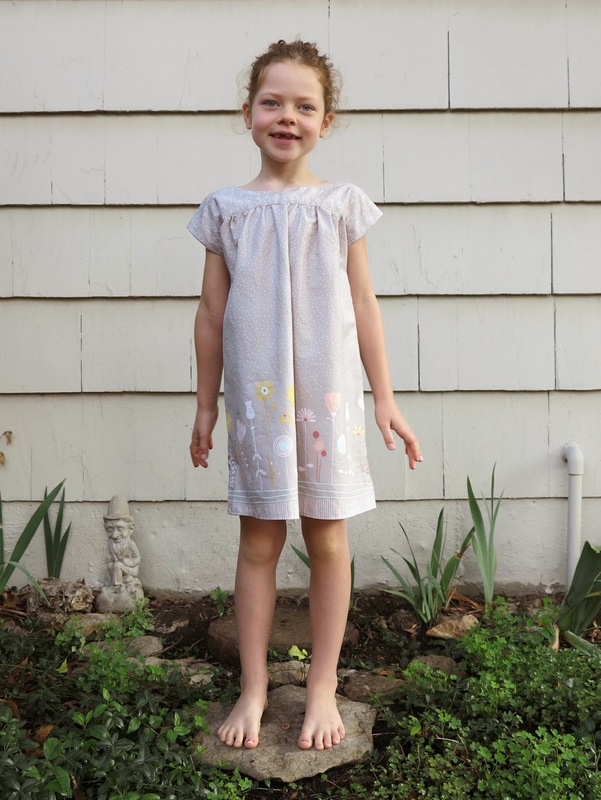 I sewed it up in a size 6 for my tall Miss Six. I can’t comment on the length of the dress pattern because I modified this bit to my own taste. But I can tell you that the width fits beautifully and once again, the design of this dress is just spot on. 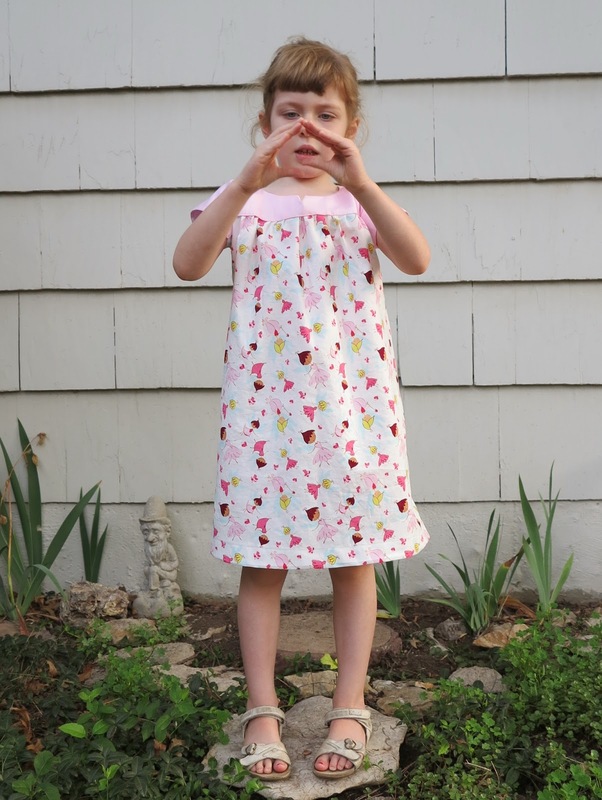 This entry was posted in cotton, dress, Hawthorne Threads, Ice cream dress, Oliver + S on August 19, 2014 by Debbie Iles. So, this dress actually worked out pretty well in the end, but those who follow me on Instagram will understand the torment that I’m talking about. Let’s start with the fabric. It is the most beautiful, vibrant printed jersey from Mood. But it is also very heavy, something I really should have taken into account when planning this make. I’m still very much in love with the fabric, but I just think I chose the wrong style of dress for it’s weight. 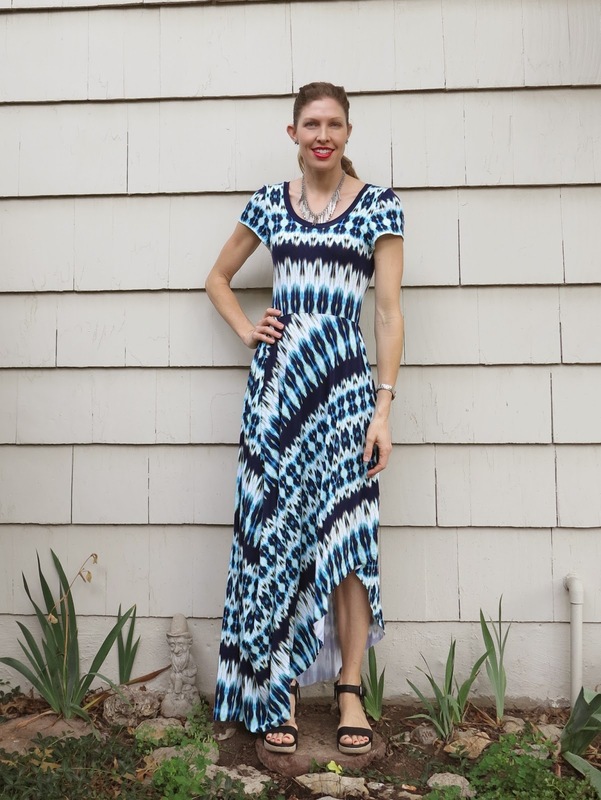 I started out with intentions of making a near identical replica of my tie dye dress, but with long sleeves for the Fall. Those who see me everyday are probably sick of the sight of my tie dye dress, but it is seriously so comfortable and swishy that I am helpless to resist it’s sherbetty goodness each time I open my wardrobe. It’s made from a similar feeling jersey, but much lighter in weight. So I began making my new dress by cutting the sleeves, but straight ones suddenly felt too boring. I decided to play around with a flared, graduated elbow length shape instead. But when I attached them, they looked a bit hippy for me. So I cut those ones off and shortened them to what you see now, but not before experimenting with a bit of silk chiffon blocking. This actually looked great, but my silk scraps were too small and my arms would have needed amputation if I wore them for more than an hour. Truth be told, I think I was just having a finicky, impossible-to-please-me kind of day. So, in the end, I settled on the short sleeves and finally decided to attach the floor length gathered skirt. It was pretty, but it was boring…to me anyway…why am I so fickle! I was looking at a very lovely bowl of creamy ice cream, but I was craving some kind of Heston Blumenthal frozen foam, which seriously wasn’t going to happen with a piece of jersey. In any case, I didn’t have to struggle too hard on my decision to unpick the skirt, because the fabric was too heavy for the bodice anyway. 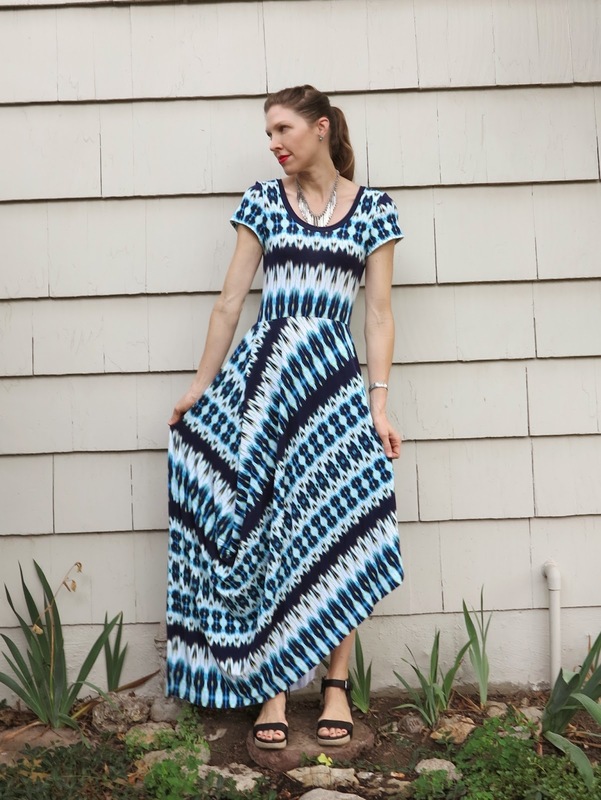 This entry was posted in dress, jersey, maxi, Mood, self-drafted on August 9, 2014 by Debbie Iles. So a little while back, I made an amazing Anna dress. And it really was a fantastic dress. It was my second Anna (my first was a wearable muslin), so the fit was great, the style indisputably pretty, and the fabric, beyond amazing. I’d even drafted a full lining attached to the facing, handstitched some of it’s innards, and took more care than usual in it’s construction. I ended up wearing it three times, to date nights and the like. 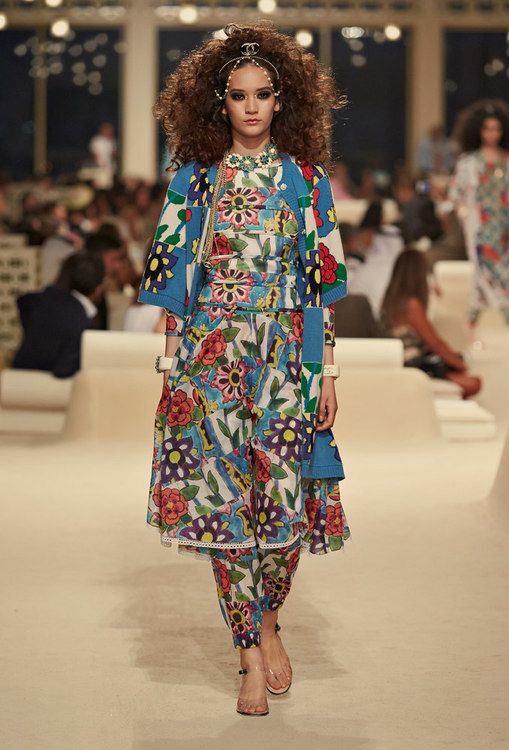 I got compliments from strangers who noticed the pretty style, or the stunning fabric, or the way the modern graphics of the print were slightly at odds with the feminine style of dress, but at the same time so perfectly matched. But each time I wore it, I always felt like I was wearing someone else’s dress. I had inklings of this when I was making the dress in the first place. 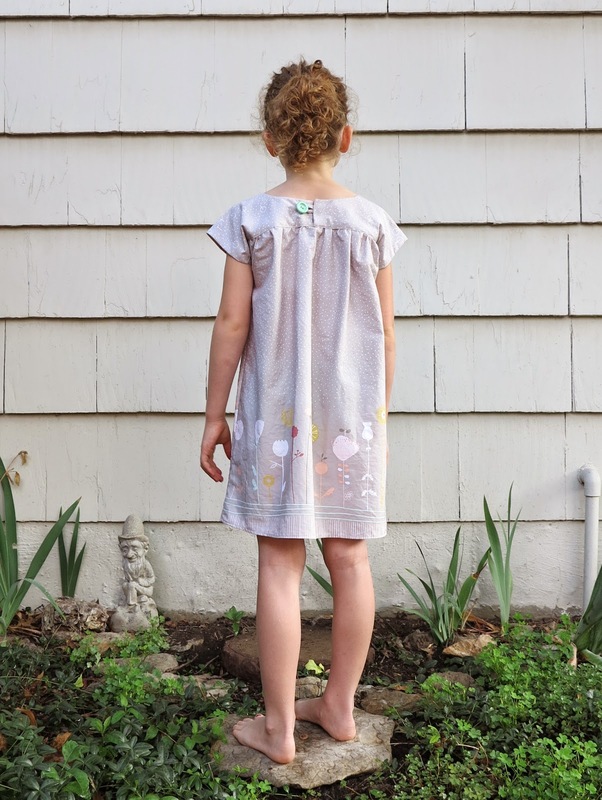 I remember observing, as I was cutting the large portions of fabric required for the gathered skirt, that I could relax because they would be large, undamaged panels that I could cut off and re-use later. My head was telling me that the fabric deserved an Anna, but my heart was telling me to do something a little more uncharted, something a little more me. Well, it’s the best of both worlds for this most special of special crepe de chines from Colette of Tessuti Fabrics. It lived a wonderful, yet short life as an Anna. And now I’ve had the double pleasure of remaking it into something a little more exciting (twice in fact, if you saw my first remake of layered trackie dacks on Instagram). The dress I made is a simple, slip-over-the-head affair. It is self-drafted, mainly because I had a very limited length of fabric to work with and no patterns on hand to match what I wanted. It is unlined, un-faced, and beautifully light to wear. I didn’t have enough fabric to make a facing or create bias binding so I fused bias stay tape to the neck and armscye edges and then turned them back as narrow hems. It worked beautifully. I also wasn’t sure whether to add the waist elastic or not, but I’m glad that I did in the end. 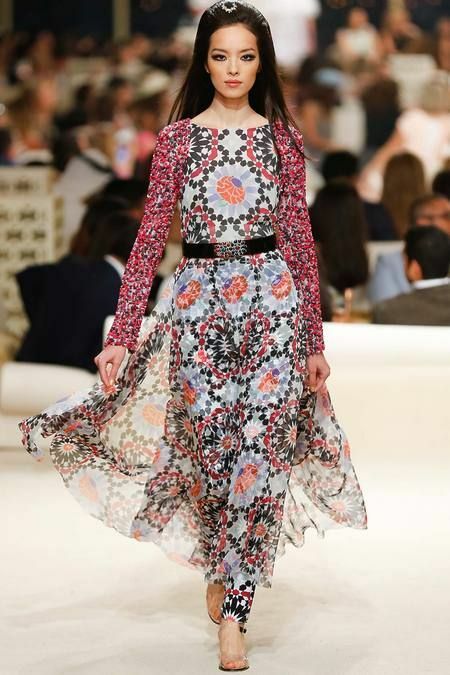 This is now a beautiful summer frock that I can see myself wearing a LOT. But wait, there’s more! Thanks to Mr Lagerfield, I was also now desperately in need of a pair of matching fancy pant trackie dacks to layer with the dress. So that I did. Once again I used Vogue 8909 (you’ve seen my other versions here and here). But this time I eliminated the yoke, faux fly, and pockets to create a more simple, streamlined pant that could be worn better for layering. 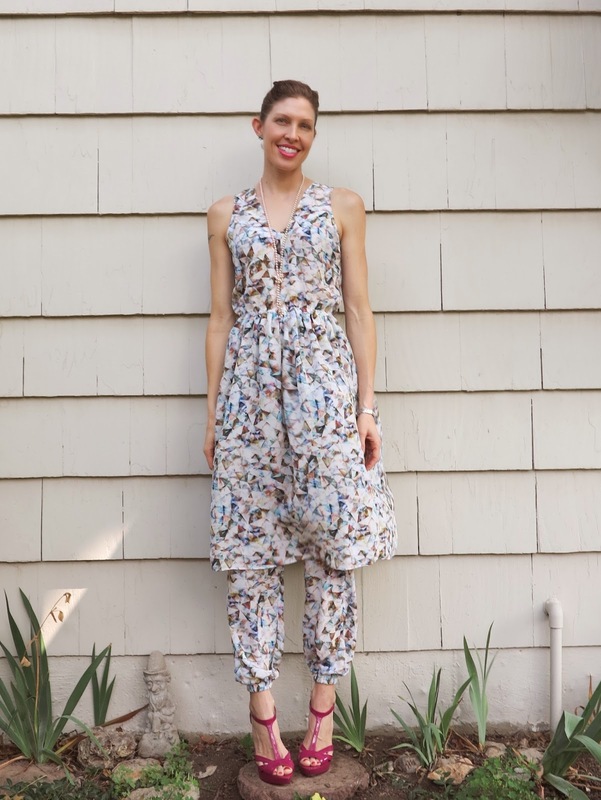 I love the way pants look layered with a simple dress and I also love both items as separates. I’m wondering if I can pass them off as a bit of matchy matchy for Ada Spragg’s Two Piece Set-acular. But before I finish up on this style, I borrowed that kimono for one last go at some print mixing a la Chanel. 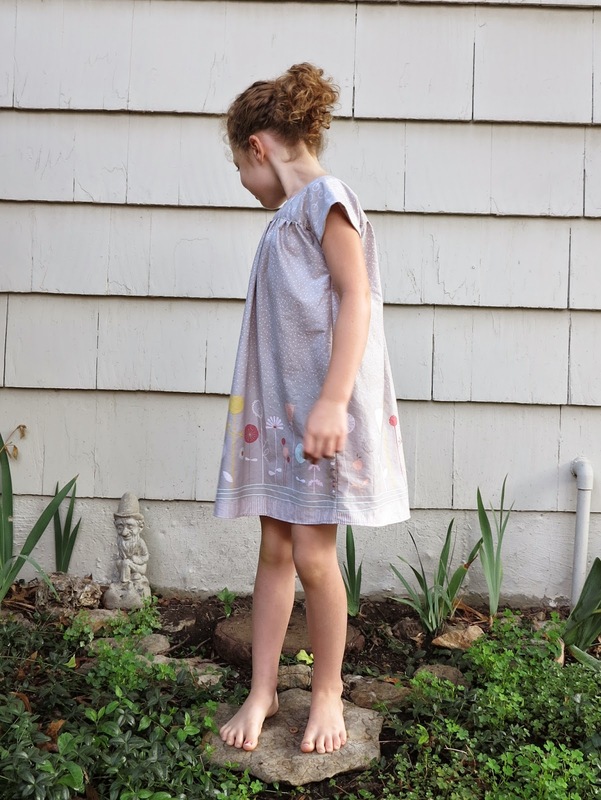 This entry was posted in Anna, dress, Gorgeous Fabrics, kimono, pants, self-drafted, Tessuti Fabrics, V8909 on August 6, 2014 by Debbie Iles. Okay, so this isn’t strictly sleepwear, and I’d be lying if I said it was the most comfortable dress I owned. But it is seriously the second most comfortable dress I own. This is my most comfortable dress. 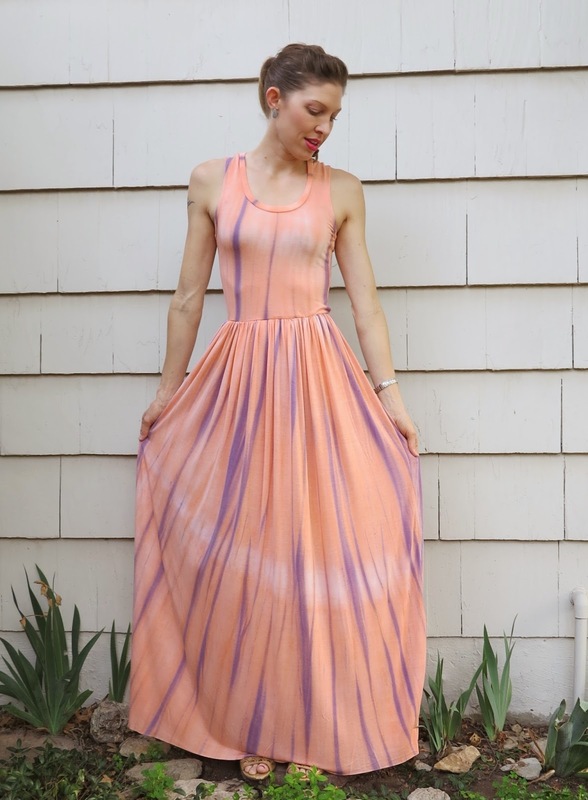 But this tie dye maxi, I could actually sleep in it if I wanted to. It is made from the softest rayon jersey from MOOD. It is lightweight and beautifully drapey, but not at all see-through. It cost under $4 per yard, so I purchased several! 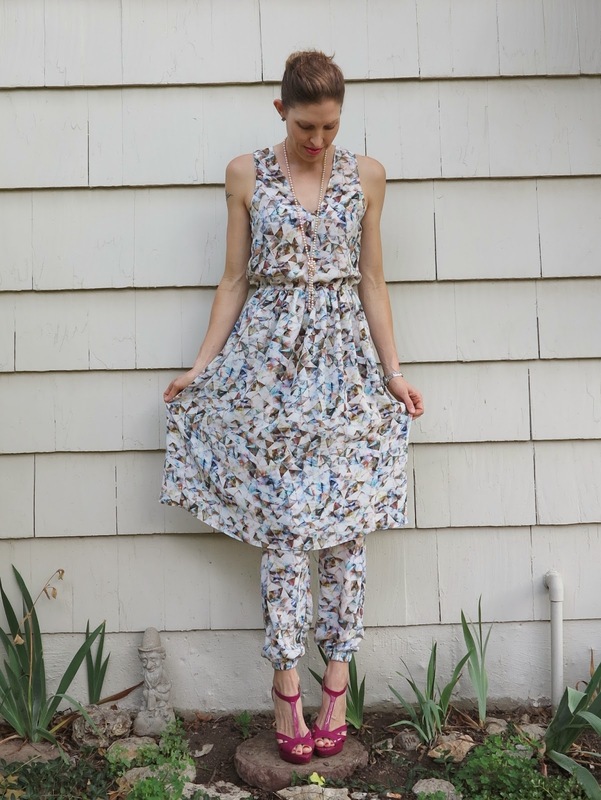 The design is a hack of my self-drafted Jaywalk dress. I just cropped the bodice to waist level and added a gathered skirt. I used clear elastic as a stay for the waist. 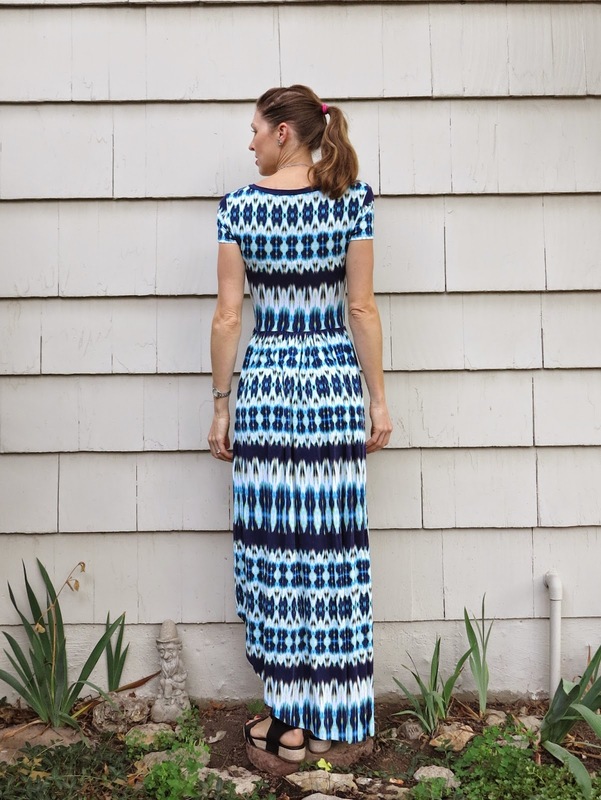 This is a great trick for pulling the waist in on a fitted knit dress. I’ve been getting A LOT of wear out of this dress. To be perfectly honest, I expected to get sick of tripping up stairs and end up chopping off the length with five wears. But it is such a light and comfortable dress to wear that I am even enjoying the length. And the colour is just delicious. It’s called sherbert. I want to eat it! 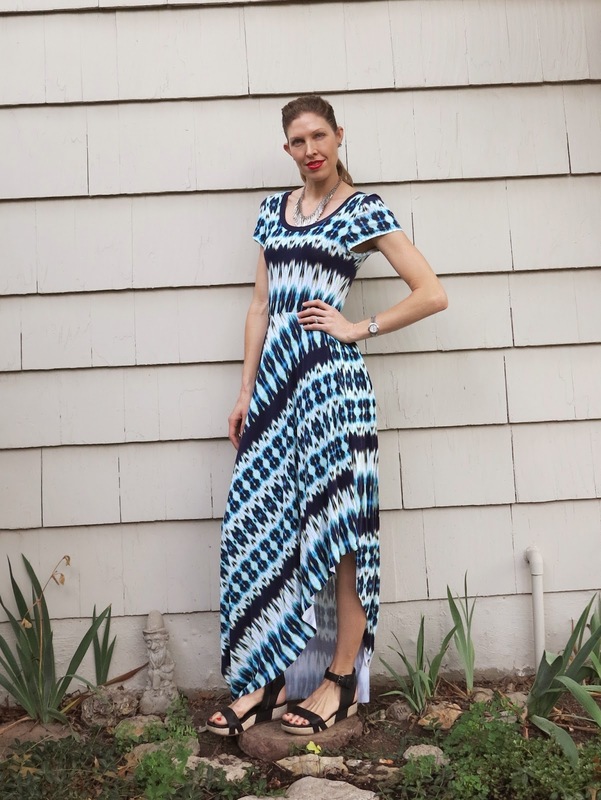 This entry was posted in dress, jersey, maxi, Mood, rayon, tie-dye on July 16, 2014 by Debbie Iles. 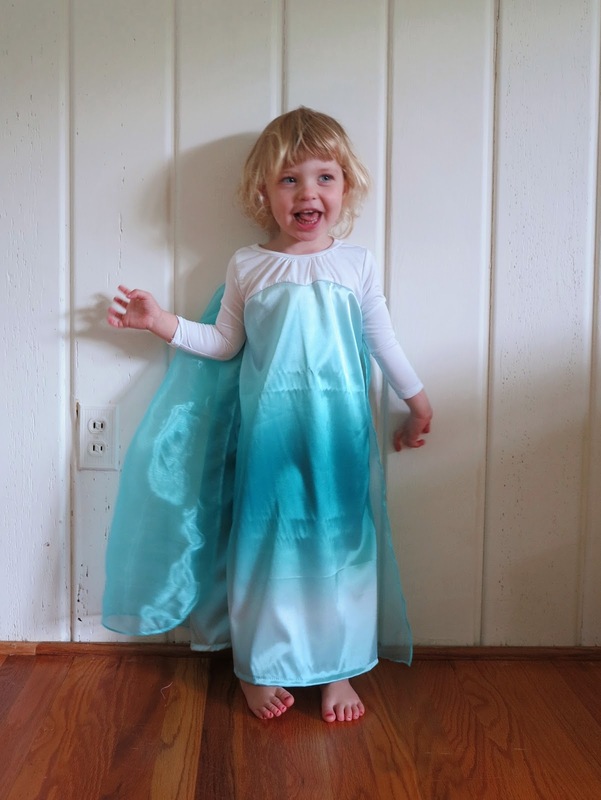 This is the fourth Elsa dress I’ve made this year and hopefully the last! 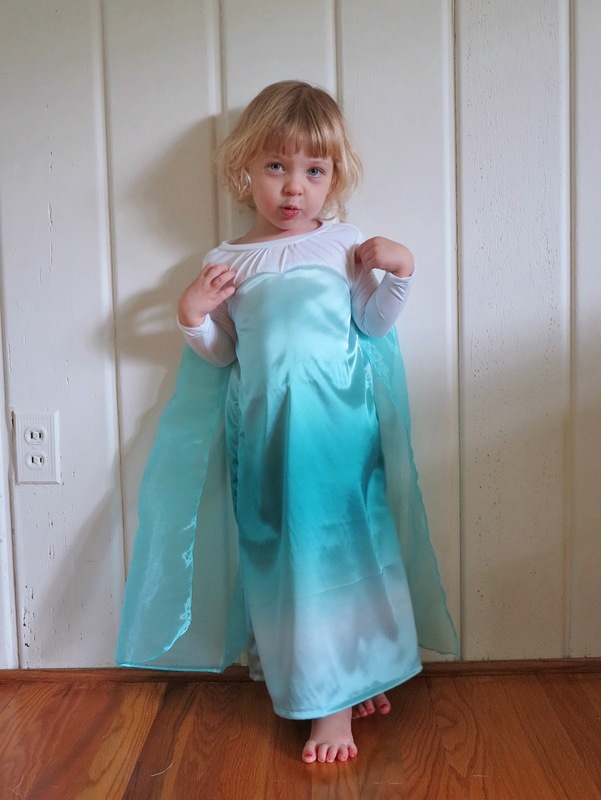 Thankfully, it’s not for any of my daughters (I’m a little sick of the sight of Elsa dresses around here), but I do have to admit that this one does look super cute on my littlest peep. Because I was making it for someone else’s child, I thought I’d have a go at making it look more authentic. But before I talk about the dress, let me just throw a figure at you. $60! Yes, that’s how much these babies sell for right now. Not the cute one with the blond hair that is. 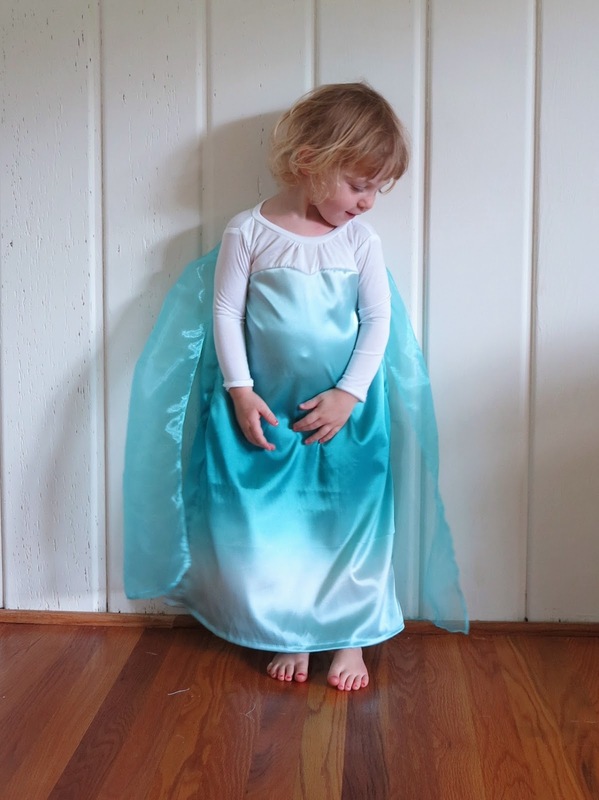 I’m talking about an Elsa dress… if you are lucky enough to find a distributer online that hasn’t sold out already! And here I am, making one for free. Well, to be perfectly honest, hubby sold my sewing services to a friend of his. I’m pretty sure he understands the value of time and sewing now (which is why I don’t sew as a business) but his solution was to offer to pay me the proper value of the dress so that he could give it to his mate. I’m still trying to figure out how that actually benefits me. But back to the dress. 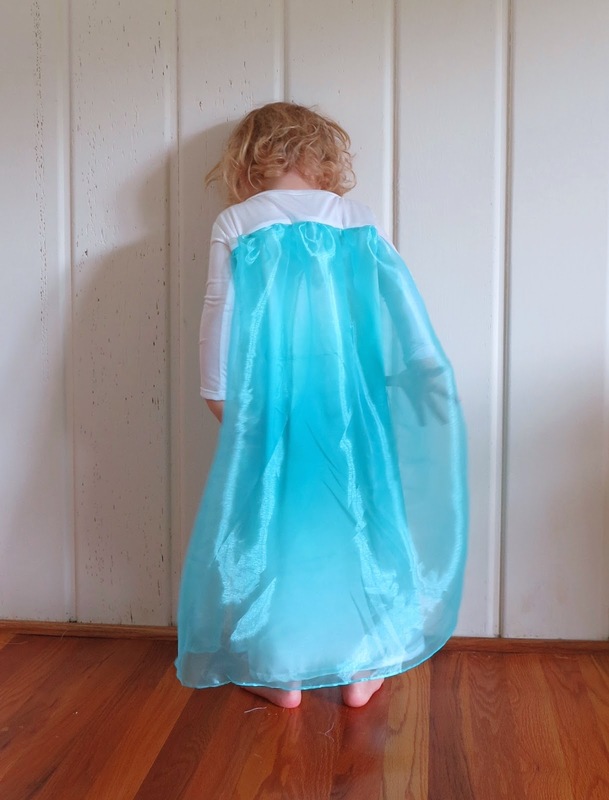 It’s made of a horrid, shiny blue, ombre polyester satin, with a polyester organza cape, absolutely ghastly fabrics to sew with (not to mention wear) and virtually impossible to press the creases out of. However, the blue satin does make for the perfect Elsa sheath. I snapped up the last of the roll on sale at Jo Ann which cost me well under $20, let alone $60! I made the stinking hot polyester wearable by using a beautifully soft and light silk/model jersey for the sleeves and yoke. The white fabric will pill with washing but it is lovely to wear. And if you ever wonder how or when I get my sewing done. I usually do it in the evening after I’ve put my three little peeps to bed. This is me the other morning, still in my PJ’s (proof that this wearable muslin came to good use after all), trying to do a quick repair job before hubby left for work. 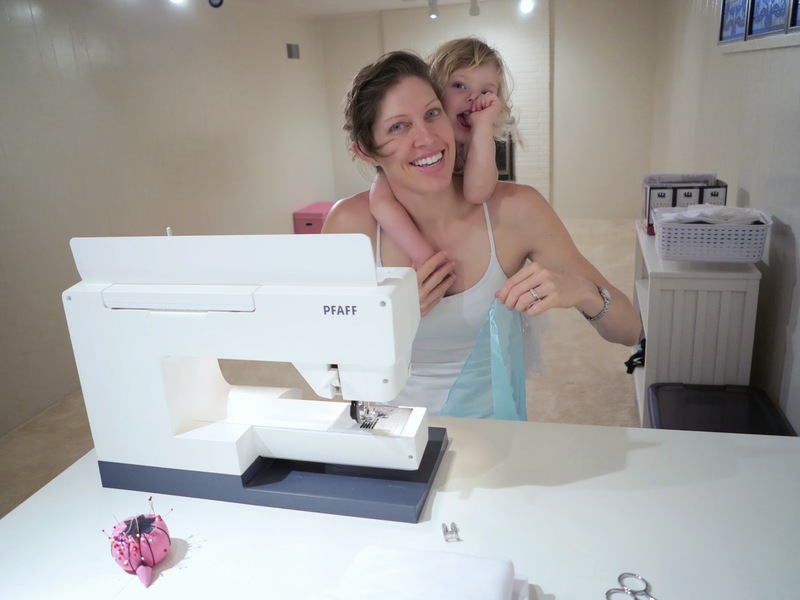 My days of sneaking in a peaceful stitch or two while the baby slept have long since departed. 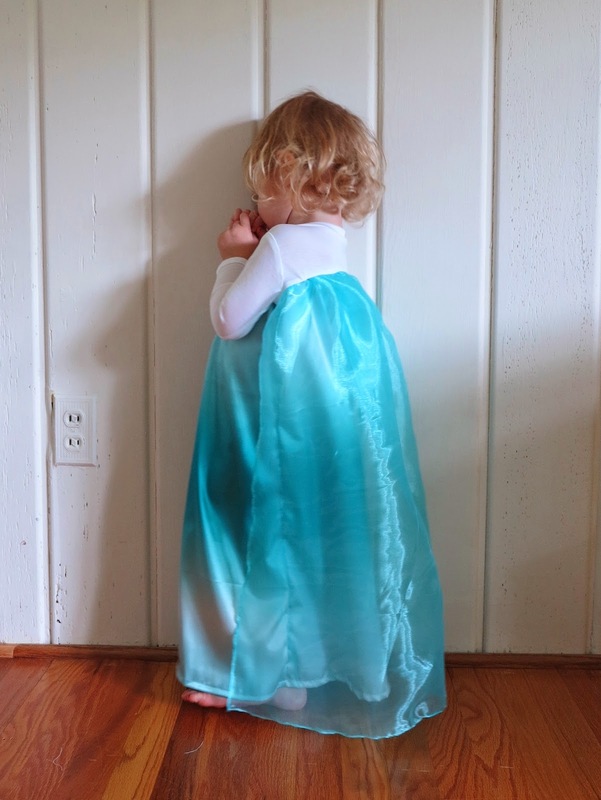 This entry was posted in dress, Elsa dress, Frozen on July 14, 2014 by Debbie Iles.